This is part 3 of my March Madness bracket series. In part 1, I showed that Florida was the best team to pick to win it all. In part 2, I explained how to choose the rest of your Final Four depending on your pool size and skill. First, I’d just like to express my frustration at a fellow Princeton publication: The Princeton Tiger. While we may all be able to relate to this list of March Madness excuses, number 5 (“I’m no sheep”) is precisely the best strategy to win your pool. Actually, it is the very misconceptions of people like this that makes the strategy of choosing undervalued picks possible. Now on to the rest of the bracket. March Madness is set up so that each round is worth the same number of points. This is not quite true. If you correctly choose the national championship, by definition you correctly chose them in every other round too, thus doubling the importance of every subsequent round. This is precisely why the first two posts focused on picking the Final Four, where most brackets are won and lost. When everyone’s bracket gets destroyed (while somewhat rare), you just need a few more wins than everyone else to walk away with the prize. So here’s my advice: pick all the favorites. Yes, all of them. You: But Max, didn’t you just tell us to choose undervalued upsets? Max: Yes, choose an undervalued winner, runner-up, and semifinalists depending on how big your pool is. But unless points are given for upsets, choose the favorite in every other game. In my bowl confidence column from January, I discovered that people tried to pick upsets to differentiate themselves from the pack. In the end, I found that if you just chose the favorites and ranked them by how much of a favorite they were, you would end up in the 90th percentile without doing anything. The same concept applies to March Madness. People think that they are smarter than the seeding. They choose upsets to get ahead of the curve. If you get two out of five major upsets (like Florida Gulf Coast and La Salle), it feels like a win. But you could have gotten 3 out of 5 if you had chosen all the favorites, and favorites have a higher chance of winning subsequent rounds too. Are you serious? Without upset points, there is no reason to believe Florida and Florida Gulf Coast are almost even money. This year, if you had chosen only the higher seeded teams in the first two rounds, you would have 44 points (multiply by 10 for ESPN’s point system). That would be good enough for about the 87th percentile. If you include games where the betting favorite was the higher seed (ex. Minnesota), you could do even better. This is how you differentiate yourself in the case of Upset City. Choose the favorite. Now, you may ask. Why doesn’t this strategy work for the entire bracket? In short, it does. By choosing the favorite in every game, you guarantee yourself a very high percentile. However, unless you are in a very small pool, you will not win. One person will luckily get more upsets than misses and win. But choosing the favorite in every game for a very small pool is probably the best strategy. Of course, seed may not indicate the favorite in the Elite Eight and later: Ohio St would have been favored over Gonzaga. 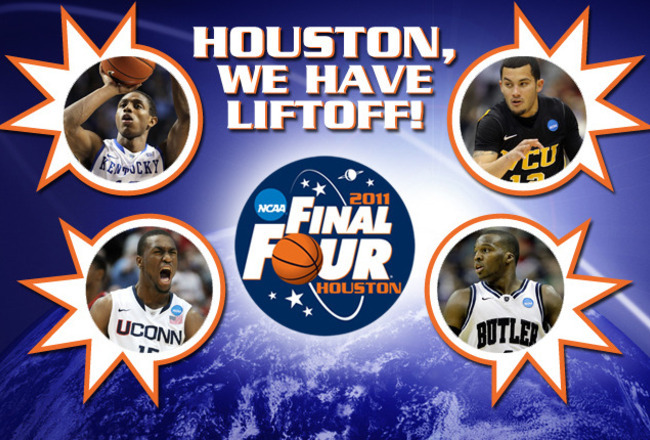 Strategy: Choose the betting favorite all the way up to the Elite Eight. This is my favorite league and it is the easiest one to gain an advantage, and as you saw above, you could make it into the high 80th percentile for regular pools. Yahoo’s upset points rule is as follows. You get the regular amount of points for every round PLUS the difference of the seeds if you correctly choose an upset. For example, if you correctly choose an 8 seed over a 9 seed. You get 1 point. If you correctly choose the 9 seed you get 2 points (1+1). Therefore, to break even in the long run, the 9 seed only needs a 33% chance to win to make it a worthwhile gamble. Without loss of generality, you can apply this to every other first round upset. Under almost all circumstances, these are worthwhile bets regardless of the teams playing. However, this is a simplified version because it isolates the first round. As you reach later rounds, the seeds become closer together (usually high seeds) and the rounds become more valuable regardless of seed. 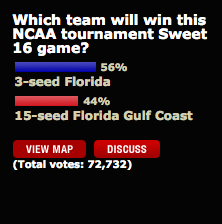 Because of this, it isn’t prudent to choose upsets for the entire bracket. So where is the cutoff? A full survival analysis would lead to the exact answer. But you are already so ahead of the curve, you have already reached a point of diminishing returns. The point should probably be before the Elite Eight because choosing a correct team would net you 7 points and the upsets are probably not likely enough to make up for that. A good rule of thumb is to pick your Sweet 16, then have every other high seed be upset in the first round. If you have a two low seeds playing each other in the second round, choose the one who was more likely to win the first game. You will make a killing in the first round. Guaranteed. In my final article in the series, I will talk about the probability of the perfect bracket and actually comb through this year’s numbers to see how well my strategies performed (will perform). Please comment below your thoughts. Especially if you have any ideas about what we should cover in the future. And please like us on Facebook too. Next Next post: Ooooh, Robin Van Persie!